Today we have something a bit different. 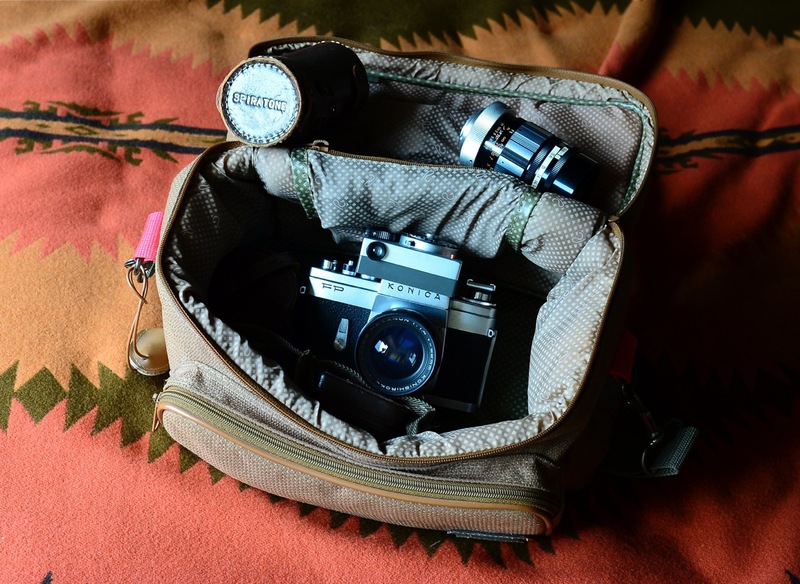 Neal Gause’s father recently passed away, and Neal has decided to share his fathers camera bags with us. A beautiful setup that I am sure got a lot of use during his father’s lifetime. I hope sharing this would put a smile on his face. George Gause, my father, recently passed away. Dad was a member of the American Society of Photogrammetry (currently the American Society of Photogrammetry and Remote Sensing). After serving in the U.S. Army during WWII he spent his early professional life making maps from aerial photographs and later, as chief of Aero Service Corporation’s Simulation Division, he managed the creation of optical-based simulations for the U.S. Navy and NASA space programs. 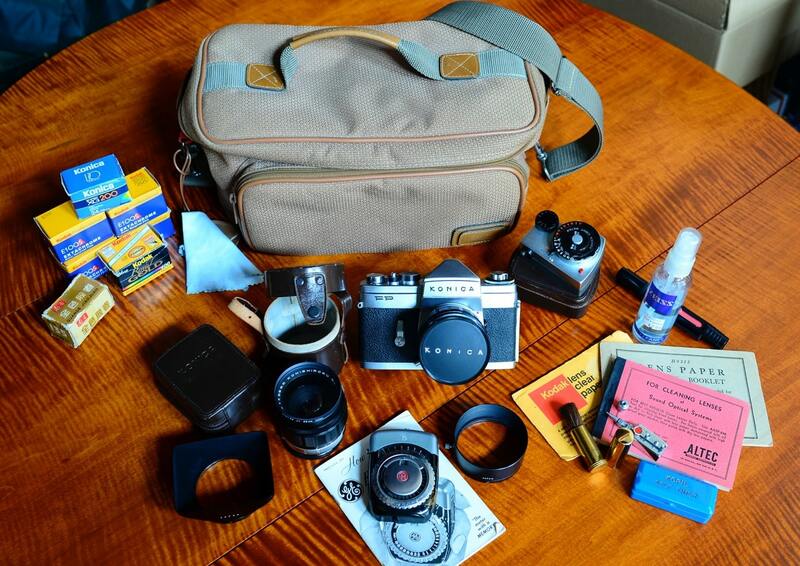 While sorting through his belongings I found an interesting bag holding his old Konica FP 35mm camera system. Dad was partial to Konica cameras, (his granddaughters ran off with most of them, but I held on to this Konica FP.) Dad knew his cameras but I think he mostly used Konica SLR cameras because they were inexpensive. The high tech camera equipment used in his professional work probably satiated his GAS drive. 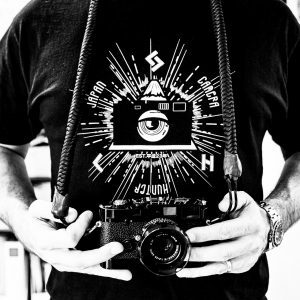 He built a darkroom in the basement of our home and I remember when I was very young he shot weddings on the weekends with a 4X5” Graflex Speed Graphic camera. Dad also had a pilot license and flying was his first love. But since this site is all about the bag let’s get to it. I found the Konica FP system in a ‘Ricardo Beverly Hills’ (RBH) camera bag. 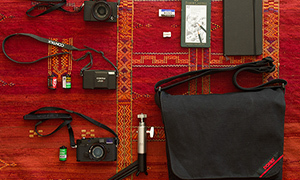 The bag is typical of camera bags carried by amateur photographers. RBH, according to their website, was founded in 1978 in Beverly Hills, California with their main business the design and marketing of luggage and travel accessories. 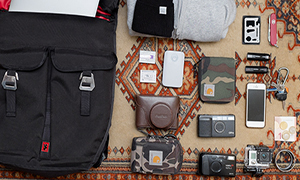 I visited their website but it looks like camera bags are no longer part of their luggage line. According to the label found inside the bag it was designed by RBH and manufactured in Korea but I could not determine when the bag was made. The bag is in excellent condition, probably because it is made entirely of high quality indestructible synthetic materials. 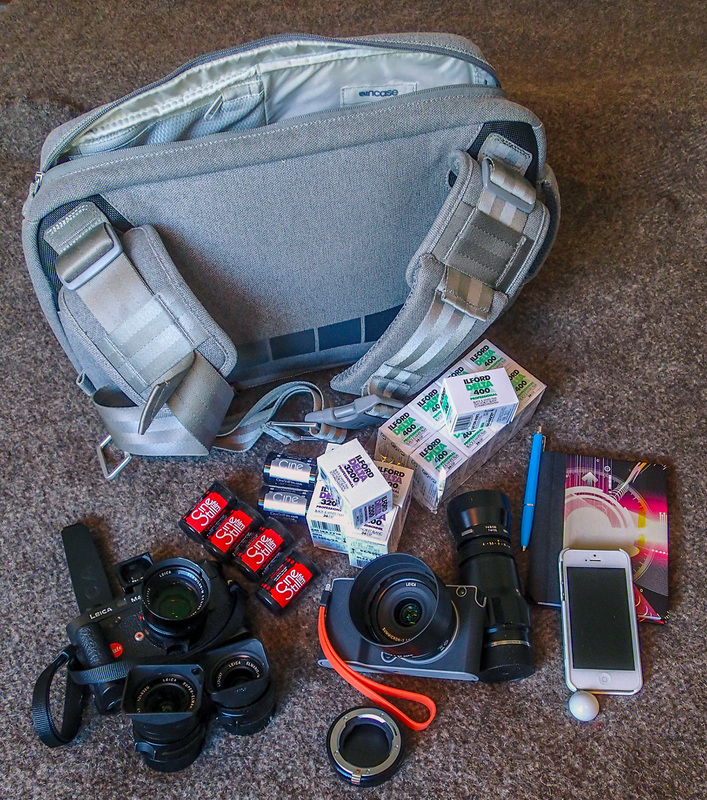 The bag’s main compartment is padded and comfortably holds the camera, three lenses, Konica clip on light meter, two lens shades and other small items. Also, the main compartment interior includes a zippered pouch and four small compartments. There is also a zippered outside compartment that held a General Electric Exposure Meter. 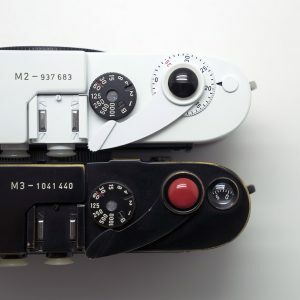 The Konica FP 35mm single lens reflex (1963-1966) is a mechanical camera. No batteries! Weighs a ton! 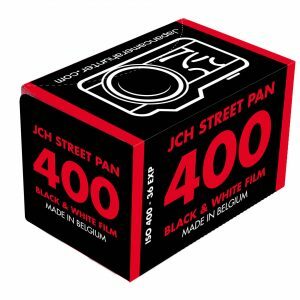 The camera’s claim to fame is that it is one of the first to use the Copal Square shutter. It also has a central microprism spot as a focusing aid. 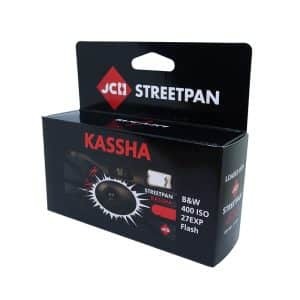 And an automatic aperture mechanism to stop down the lens to whatever aperture has been set when the shutter is triggered. So the Konica FP is an interesting early SLR. 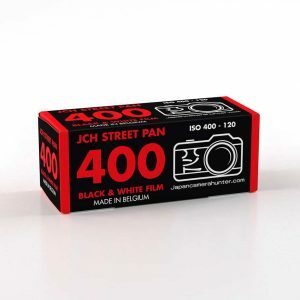 I left home in 1965 so I don’t have much first hand knowledge of the Konica FP but it seems clear that the RBH bag was not the one Dad actually used with the FP. Ricardo Beverly Hills wasn’t founded until 1978 and Dad used the FP in the mid 1960s. Dad’s Konica FS-1 (1979-1983) and later Konica cameras are the more likely cameras that he carried in the RBH bag. Dad shot Kodak Tri-X black and white film and Kodachrome slide film to photograph family, family vacations and the occasional air show. We have thousands of his slides. He shot with digital cameras when they became viable preferring pocket sized digital cameras and he continued to shoot 35mm film. Thanks for sharing your father’s bag with us, Neal. I hope that it is a suitable memory for him. Neal, What a joy to read your entry about your fathers bag. 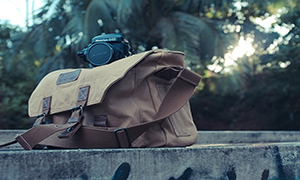 After over 65 years of amateur photography, your Dad’s bag is almost a copy of mine after many years of progressively expensive equipment and a resulting loss of interest. Recently returned to my old Konica T3 and Hexanon lenses, hand held meter, Tri-X film. Photography is fun again.